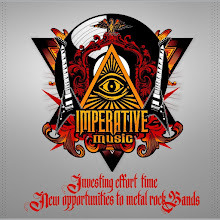 Imperative Music Agency Compilation: USA, LAS VEGAS CITY, THE HOLY PARIAH BAND (U.S.) METAL HORNS!!! USA, LAS VEGAS CITY, THE HOLY PARIAH BAND (U.S.) METAL HORNS!!! From Las Vegas city, The Holy Pariah band (U.S.) was presented Imperative Music’s new compilation vol. 12 and show their horns!